This day we four parents left our kids (six of them ages 5 to 18) at the beach house, and escaped for a day trip to Westport. The day was rainy, so we needed a place with a couple indoor attractions. The drive from Pacific Beach to Westport via Aberdeen lasts about one hour. We started at the Grays Harbor lighthouse - the tallest in Washington state. I've written about the lighthouse before, so I'll just mention a few things. We had a different docent than the time before, so I learned a few different facts. One thing of note is that the 135 step iron spiral staircase is freestanding - not bolted to the building. It does rest on a few ledges built out of the walls, but otherwise it supports itself by several braces propped against the inside of the building. Iron and concrete expand and contract at different rates, so any bolts drilled into the walls would have pulled loose over time. From the lighthouse we hurried over to the maritime museum before closing time. 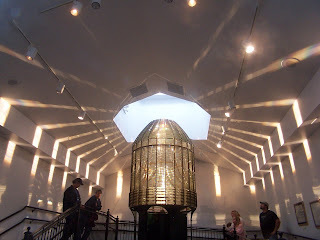 Three attractions here made this visit very worthwhile: the main building itself, the former coastguard station, is very beautiful; two whale skeletons are displayed outside; and a neighboring building is devoted to the Fresnel lens (pictured above) from the Destruction Island lighthouse. The lens, when they turn it on so that it rotates and shines light out from the inside, is a surpassingly beautiful sight. Destruction Island is otherwise inaccessible to tourists, so it is fortunate that the lens was moved here. Next, we went for a walk through the town in a light drizzle. Across the street was the marina, where some boats were selling freshly caught fish (tuna, in this case). We stopped at the One Eyed Crab for some wonderful seafood and clam chowder. Next, we bought saltwater taffy at Granny Hazel's candy store. They offer 50 flavors of saltwater taffy. We located the aquarium, but a sign on the door said that the pumps had failed and the attraction was closed indefinitely. We ended our stroll at the blue observation tower at the north end of town. We spotted several surfers in the cold water below us. The waves were pretty active, so some of them were managing to catch a good wave. 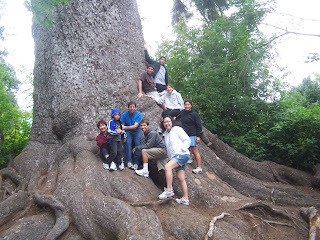 The amazing Big Spruce is found along Lake Quinault's South Shore Road adjacent to the Rain Forest Resort Village. A sign on the road identifies the spot and parking if provided for about 10 cars. A short quarter mile trail brings you through some bushes, over a stream, and up to the tree. The tree is said to be 1,000 years old and reaches a height of 191 feet. Nearby you can spy a nice view of Lake Quinault on the resort's grounds. We meander over there to enjoy the view and the beach. We returned to Higley Peak on August 25, 2008. If you recall, we had visited there at the end of June, but snow on the road blocked access by our car. We trudged on several miles in the snow, but never found the trail to the peak. This time the snow was all gone and the road had been cleared of fallen trees, so we drove right on up. We stopped at a clearing where the road widens out and you have a view of a green valley to the north and a beautiful stand of moss-covered trees to the south dropping away down a steep hillside. This was the furthest point we reached on the June visit. And lo and behold! I found the trail at this point. It is found on the hill to the southwest. The entrance to the trail is overgrown. A sign marking the entrance has fallen down. A few tens of yards into the trail is another sign that identifies the trail for certain. So we proceeded up the trail. The trail is narrow and almost disappears in a couple spots. Below you the hillside drops away very steeply. The trail climbs steadily and wraps perhaps 3/4 of the way around the peak - rather than switching back and forth. You pass a gigantic rock formation about mid way. As you wind around the mountain, you are bound to catch the side facing the sun, and this lights up the forest beautifully. After half a mile, you reach the peak. There is a little clearing at the peak. Some posts and concrete blocks indicate that something was once constructed here, but it is gone now. 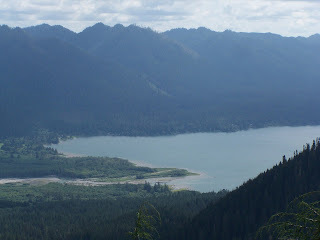 Now, my interest in Higley Peak originated from the idea that we would get a view of Lake Quinault. The peak hovers over the middle of the lake's north shore. Unfortunately, some young trees have grown up and almost completely blocked the view. You just get a narrow glimpse through some branches. Back down at the base of the trail, we drove another three miles up the road beyond the peak. At the 12.5 mile mark we were rewarded with a great view (pictured above). Here you can see the upper Quinault River emptying into the eastern end of the lake with the mountains of the Colonel Bob Wilderness looming over the scene. The road continues further, but we turned back at this point. 1. Turn onto Prairie Creek Road from Highway 101. This road is found about 1 mile west of where the highway bends to the west near the lake's North Shore Road. Prairie Creek Road is a dirt road, but well-maintained (in August, at least). 2. On the lower part of the road, you will encounter two forks in the road. Bear to the right at each of them. The first fork is unmarked. The second fork has a sign for Higley Peak. There is sort of a third fork, where the road straight ahead is very faint, but it is pretty clear that the main road veers to the left up the first switchback. 3. At the 9.5 mile mark, you have reached the peak. Before this point, a hillside on your right had been restricting your view in that direction. At the base of the trail, the road opens up into a clearing with views to either side. A very pretty stand of trees laden with moss are to be seen towards the lake side to the south. Up ahead the road drops away (for about the next mile). Once you have identified the spot, you can find the trailhead to your southwest, hidden by the undergrowth against the hillside. Once you pass that initial undergrowth, the trail is easy to follow. 4. Continue another 3 miles along the road to the 12.5 mile mark for the best view - a view of the eastern end of the lake and the river valley. First of all, you may wonder if bike riding works on the beach. I wondered that too, but then I looked at some old pictures of my youngest boy on the beach, and one picture showed a family with bikes in the background. So I resolved to try it. There is a strip of hard, flat sand just above the waterline. If you stay in that strip, the ride feels just like riding on asphalt. If you stray too close to the water or too high on the beach, the sand gets soft and the ride becomes arduous. On this ride, I entered the beach down the Analyde Gap Road at the north end of Pacific Beach and rode north towards Moclips as far as I could go. 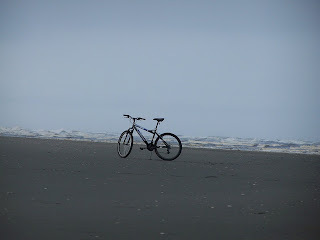 The interesting things to see along this ride were: the sun rising above the cliff and obscured by the clouds, a mixture of seagulls and crows on the beach, the many beach houses in Moclips, and a flock of sandpipers dodging in and out of the surf. After two miles, I reached the Moclips River, which runs too wide and deep to cross. Here the sand grew soft, so I parked the bike and walked along the river. Across the river the cliffside is completely undeveloped - compared to Moclips where it is lined with houses. Dozens of old, decaying posts are set in the river and the nearby beach. It looked like this may once have been a bridge across the river. Nearby I found a boundary marker for the Quinault Indian Nation. The reservation evidently extends a bit south of the river. You ordinarily need a beach pass to visit the QIN beaches, but I don't suppose anybody enforces that rule here.